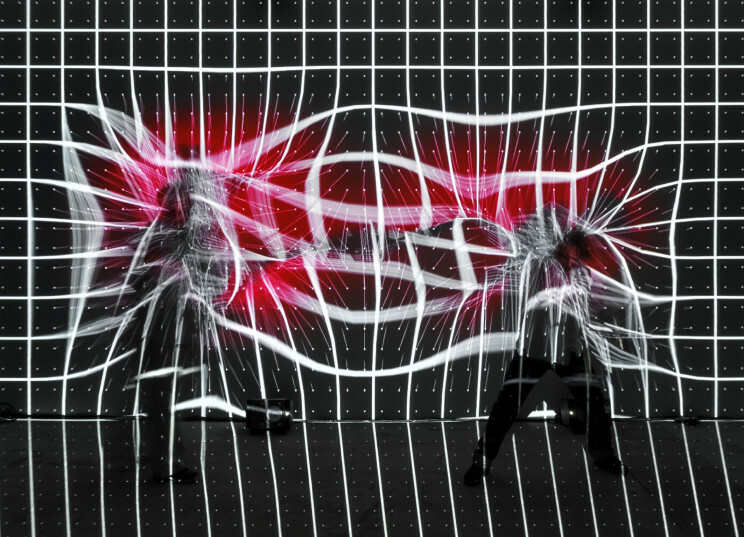 Resonant Grid is an audio-visual, interactive realtime installation with projections and 8.1- channels audio for up to 5 players (exhibition visitors) and audience. It analyses the movements of the visitors as they pass through the exhibition space. The visitor’s action is translated into projection and sound in realtime. The number, manner and fluidity of the people’s motions create a social sculpture: an audio-visual moment that is simultaneously perceived and shaped by visitors – a living and constantly changing work of art. The visitors take over as an active part of the exhibition, as only their movements design the work and the exhibition which is perceived by other visitors. After exploring the art work for a while the visitors realize their representation through sound. Going on exploring in a playful way, they start composing a piece of music with each other. The visual content is based on different grid like structures. While the visitors move through the space they influence the grid distortion which is shown in the repulsive and attractive deformation of the grid projection. Therefore the visual representation is not only a visual tool to create and play but as well a reflection on the realtime forces involved in the installation. The work was shown in exhibitions at photography playground in cologne and vienna in 2014. Resonant Grid in action. On the left marcus doering, on the right ben lauber. On the floor you might notice 2 of 8 loudspeakers.